Jonas Bailey, Sr., was born about 1755 in an unknown place and died about 1830 in Marion Co., South Carolina. Dates for birth and death are estimated. He lived to be about 75 years old. Samuel David (abt. 1810 to 3/16/1900). 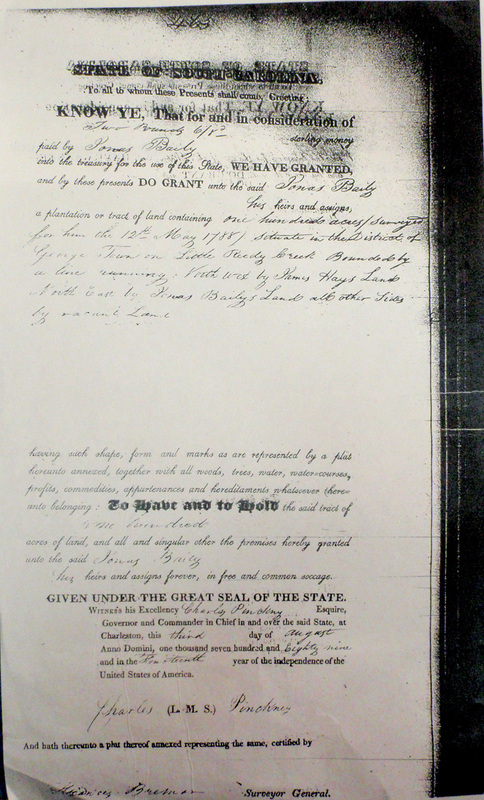 Jonas Baley, from Lancaster Massachusetts, enlists from Worcester County for the term of 9 months from the time of their arrival at Fishkill, June 7, 1778. Capt. Ager's CO, Col. Whitney's Regt. 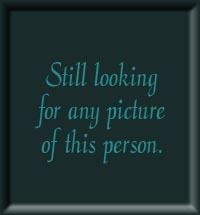 He is 26 years old, 6 foot tall, dark complexion. His residence is Lancaster. Jonathan Baley, age 44, is also registered at the same time, for the same term, and is also from Lancaster. From: soldiers and sailors of the Rev. War. Comp. By secy. Of the commonwealth, Ms. Boston. 1896-1908. (17v. ):2:456 -- Jonas Baily, born in Massachusetts, is listed in Volume 1, page 528. NOTE: It appears this Jonas Bailey dies in MA. However, we are leaving this post until it has been confirmed to not match our Jonas. It is also noteworthy that by 1790, only one Bailey family (Benjamin Bailey) is still living in Lancaster, MA. Receipt for $206.80 and the purchase of 100 acres near Little Reedy Creek, near the town of Marion. Near Little Reedy Creek and James Mayer's land. 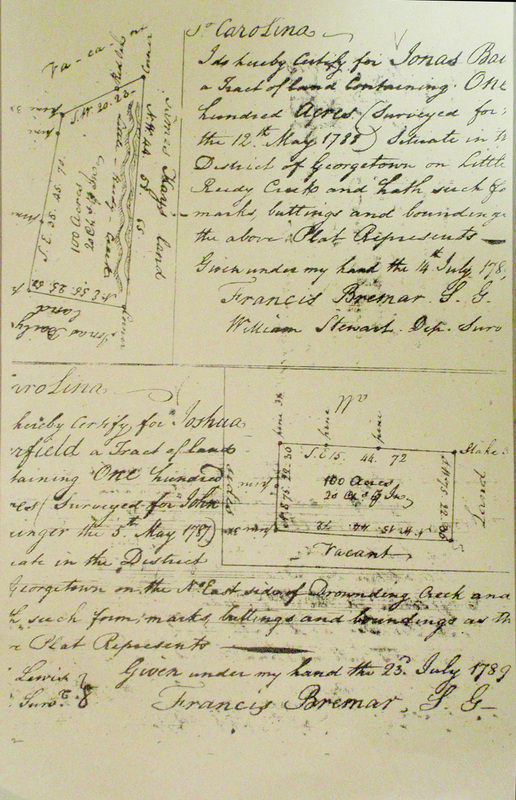 Copy of two land deeds for 100 acres in the District of Georgetown on Little Reedy Creek. One is dated July 14, 1789 and the other is July 23, 1789. Jonas Bailey purchase of 1000 acres of land from James Waters on the SW of the Pee Dee River and N side of Little Reedy Creek. Page 53: Living in Georgetown District, Prince Georges Parish -- The family of Jonas Baley is described as consisting of 4 free white males of 16 years and upward (including heads of families), 5 free white males under 16 yeears old, and 3 free white females (including heads of families). They have no slaves or other free persons living in the house. Additional information about Georgetown County, SC around 1790: Originally established in the 1730, this area was one of three townships with a courthouse and jail by 1770. It was also an official port with its own customs collector. Georgetown also held popular horse races in December each year. It was also one of the largest rice-producing areas. 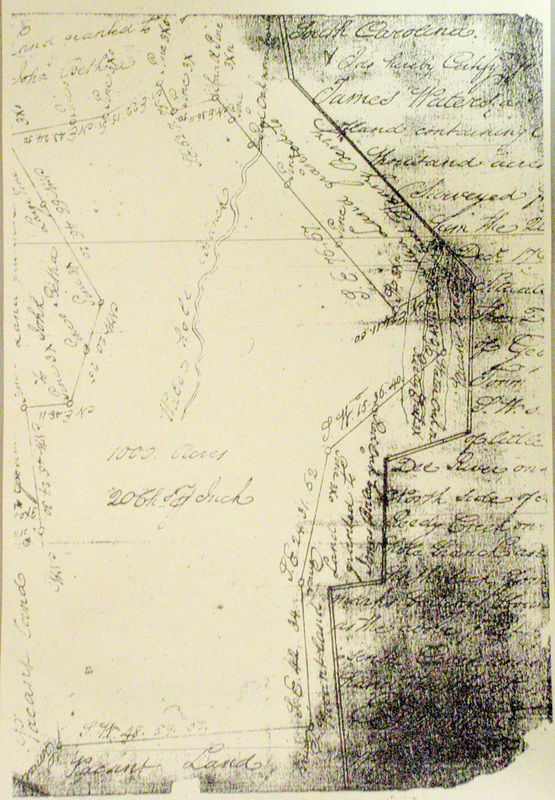 In 1785, the Georgetown District was divided into Winyah, Kingston, Williamsburg, and Liberty Counties. Later Winyah will become Georgetown CO; Kingston will become Horry CO; and Liberty with become Marion CO. Click here to see a map from this timeperiod. Jonas Baley is listed with a household containing 5 males 26-44 ,one male 45+ and 3 females 16-25,one female between 26 and 44,with no other free persons and no slaves. Additional information about Marion County, SC around 1800: Marion County was first created in 1798 (two years earlier), when the courthouse districts were created in South Carolina. It was named "Marion District." Prior to this, it had been part of Liberty County in the old Georgetown District. Click on any of the News, Events, or Discoveries buttons above to see historical things that happened during Jonas Bailey's life. These are only some of the major events that affected the life and times of Jonas, his family, and friends. For example, Jonas is 5 years old when The Cherokee War (1760-61) ends in a treaty that opens the Up County for settlement. 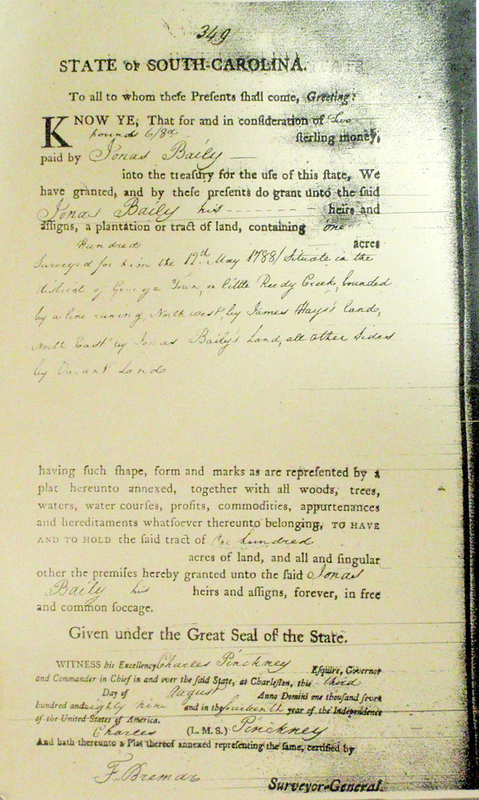 The Bounty At of 1761 offers public land tax free for ten years, and settlers from other colonies begin pouring into the Carolina "Up Country". 27 1782 During 1782-1783, land to the south and west of the Tugaloo and Savannah Rivers are ceded by the Cherokee and Creek. 28 1783 Charles Town is officially renamed Charleston, SC. 33 1788 South Carolina joins the United States of America. State government is moved from Charleston to Columbia two years later. 75 1830 South Carolina becomes the first state to secede from the Union, setting the stage for the creation of the Confederacy. The Children of Jonas Bailey Sr.
Born in Marion Co., South Carolina about 1766 and died in Marion Co., South Carolina about 1840. He was about 74 years old. Born in Marion Co., South Carolina about 1768 and died in Marion Co., South Carolina about 1838. He was about 70 years old. Born in Marion Co., South Carolina about 1770 and died in Marion Co., South Carolina on June 1, 1860. He was about 90 years old. Born in Marion Co., South Carolina about 1783 and died somewhere in South Carolina about 1870. He was about 87 years old. Born in Marion Co., South Carolina about 1789 and died somewhere in South Carolina about 1865. She was about 76 years old. Born in Marion Co., South Carolina about 1790 and died in Marion Co., South Carolina about 1855. He was about 65 years old. Born in Marion Co., South Carolina about 1801 and died somewhere in South Carolina on March 8, 1900. He was about 99 years old.